Are there worries in your life? Do you need help? We say the rosary to help us remember principal events or mysteries in Christ's life on earth and to praise God for them. You do not have to be a Catholic. 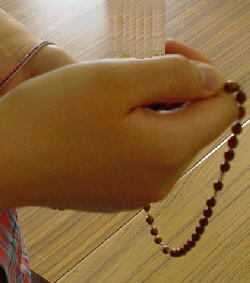 If you do not have Rosary beads, you can count with your fingers. But counting beads frees your mind to help you meditate. There are twenty mysteries reflected upon in the Rosary. They are divided into the five Joyful Mysteries, the five Luminous Mysteries, the five Sorrowful Mysteries, and the five Glorious Mysteries. John Paul II said the rosary every night before sleep.